Eastern Ontario’s Beau’s All Natural Brewing and Shawinigan, Québec’s Microbrasserie Trou Du Diable will launch a cross-border collaboration brew this week. 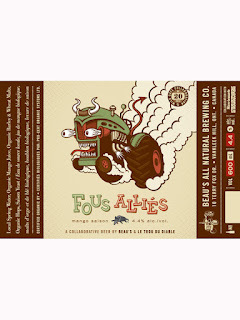 Fous Alliés (“Crazy Allies”), a mango-juice infused Saison style beer, will be available in Ontario only, direct from Beau’s retail store in Vankleek Hill, and in Ottawa through BYBO home delivery (www.bybo.ca). 2,500 limited edition 600 ml bottles will be made available beginning Thursday May 24, and will retail for $7.85. Select restaurants and pubs across Ontario will also have Fous Alliés on tap to enjoy. Expect tropical fruit aroma with peppery notes on first experiencing Fous Alliés; the flavour is also fruity and faintly tart, with a pleasant, dry finish. Lively carbonation and hints of white pepper accentuate the fruity character. Delicious mango flavour adds complexity, slight earthiness, and playfulness to the presentation. A quaffable 4.4%, O’Hara suggests pairing Fous Alliés with ceviche, pad thai, classic Belgian frites, or any soft, creamy cheeses such as cammenbert, or brie, e.g. brie baked with cranberry. This is the third release in Beau’s Friendship series, a collection dedicated to collaborative brews with talented and innovative brewers from around the world. This is the first time Ontario and Québec craft brewers have teamed up to create a collaborative beer at a production brewery, and in August these two will team up again: O’Hara will head to Shawinigan to work with Trudel to brew something there for the Trou Du Diable local following. A tasting event and official launch of Fous Alliés will take place this Saturday evening, May 26 from 5-8 pm at Beau’s All Natural Brewery in Vankleek Hill. Groups from both Beau’s and Trou Du Diable will be on hand to sample the beer and talk about this unique collaboration. The Beau’s patio will be open (weather permitting), and food will be served up by VKH locals The Cougar’s Den. 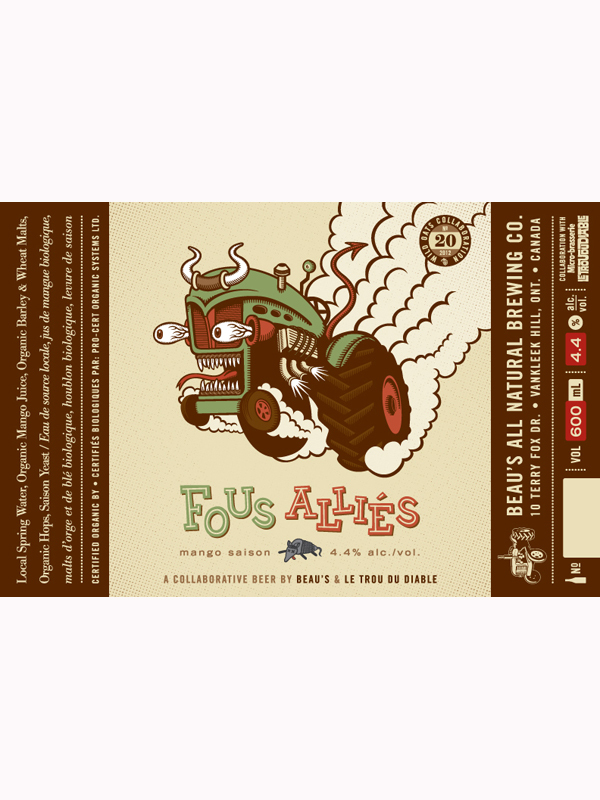 Fous Alliés will be available for purchase in 600 ml bottles from the brewery beginning Thursday May 24, at 10 am. Presales for home delivery in Ottawa beginning May 24 are available now, through the online BYBO service (www.bybo.ca). Next month Beau’s will release #4 in the Friendship series: ice wine infused and wine-barrel-aged Venskab, brewed with Scandinavian brewer Anders Kissmeyer.